Chockler, Qi Huang, Jure Leskovec, Deepak Nataraj and Yoav Tock. – Group scalability in IP Multicast. – Group scalability in gossip. • Useful, but rarely used. – Thus they choose to disable it. • Policy: Enable control of IPMC. • Explicitly allow a process (user) to use IPMC groups. • Point-to-point unicast always permitted. logical IPMC group to physical IPMC group. 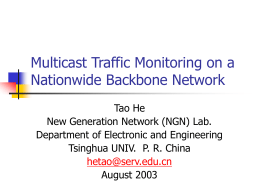 IPMC and unicast addresses s.t. • Prefers sender load over receiver load. • Control knobs part of administrative policy. selectively enable and control IPMC. user, standard IGMP interface to network. random node once per round. – Scalable in group size. – Pick node d uniformly at random. – Pick a rumor r uniformly at random. – Few bytes hash of actual information. • Packet size below MTU irrelevant. – Stack rumors in a packet. • Rumors can be delivered indirectly. when it reaches the target group. – GO+MCMD optimizations based on group overlaps. – Explore the properties of overlaps in data sets. expect to arise in the real-world? 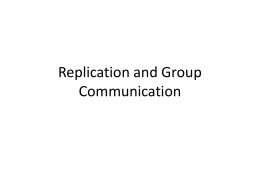 • What’s in a ``group’’ ? • Typical for real-world systems? – Only one data point. – Motivated by Live Objects. • Is the similarity we see a real effect? degree distributions as a baseline. • At most 50 samples per group size pair. 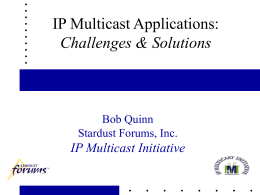 • Dr. Multicast harnesses IPMC in data centers. – Impact: HotNets paper + NSDI Best Poster award. – Solution being adopted by CISCO and IBM. • GO provides group scalability for gossip. – Impact: LADIS paper + Invited to the P2P Conference. – Platform will run under the Live Objects framework. systems is exciting current and future work. GO: Platform Support For Gossip Applications. With Ken Birman, Qi Huang, Deepak Nataraj. LADIS ‘09. Invited to P2P '09. Adaptively Parallelizing Distributed Range Queries. With Adam Silberstein, Brian Cooper, Rodrigo Fonseca. VLDB ’09. Renesse. PODC ’08 (short). In IEEE Transactions on Computers 2009. 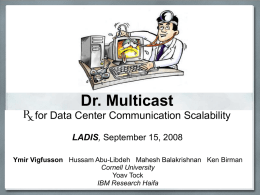 Dr. Multicast: Rx for Data Center Communication Scalability. With Hussam Abu-Libdeh, Mahesh Balakrishnan, Ken Birman, Yoav Tock. Hotnets ‘08. LADIS ‘08. 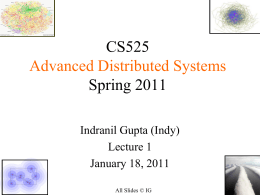 NSDI ‘08 (Best Poster). Hyperspaces for Object Clustering and Approximate Matching in P2P Overlays. With Bernard Wong, Emin Gun Sirer. HotOS ‘07. • Cell: Avg. Δ over particular group sizes. 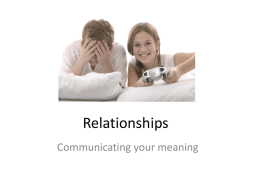 • Social affinity pretty random. • Websphere has substantial overlaps. • GO: Platform Support For Gossip Applications. • Adaptively Parallelizing Distributed Range Queries. With Adam Silberstein, Brian Cooper, Rodrigo Fonseca. VLDB ‘09. Renesse. PODC ‘08. In IEEE Transactions on Computers 2009. 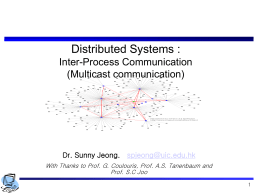 • Dr. Multicast: Rx for Datacenter Communication Scalability.